Park Avenue Liquor Shop, the Manhattan liquor oasis, has been in the exclusive whiskey biz for some years, carrying various one-of-a-kind whiskey bottlings, some sources from Tuthilltown's stores and bearing the store's own name. Now the Goldstein family, which has owned Park Avenue for 50-plus years, is getting into the tequila biz. The shop has acquired what it claims is one of only three existing barrels of tequila from Casa Noble CEO Jose “Pepe” Hermosillo. These casks are known as his “friends & family” barrels and, sez Park Avenue, have never been commercially available. 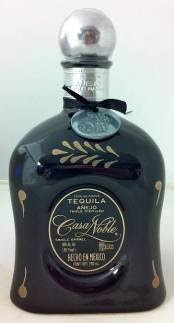 Casa Noble Single Barrel Extra Anejo Tequila Aged 7 Years was bottled exclusively for the store. It is certified organic and, in case that weren't enough, Kosher for Passover. The 80 proof, 750ml bottle will retail for $100 is available for purchase now. Only 300 bottles are available. I have tasted a sample. It's dark in color, very smooth, and has a kind of Cognac quality, with all the concomitant flavors. The unusually old tequila (by comparison, regular Anejos are aged a minimum of one year) is aged in a single French white oak barrel, made from 100% Blue agave, and triple distilled. Single-barrel Tequila—you don't see that much.